This traditional Thai dish features the popping flavors of lime and mint with pork and vegetables. 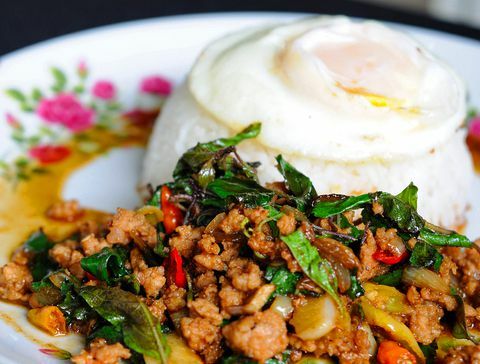 It is served with plenty of Thai jasmine rice and sometimes a fried egg on top of the rice. The egg isn't necessary with so much good protein in this dish, but try it if you enjoy experimenting with traditional cuisines and tastes -- the recipe is simply divine either way. Once you have the stir-fry sauce mixed together (super easy! ), the vegetables and meat chopped, and the fresh herbs prepared, this dish cooks up in no time. The fresh mint is folded in at the end for the freshest flavor, and then you're ready to sit down to some true Thai cooking from your very own kitchen. Mix the stir-fry sauce ingredients together in a cup. Set aside. Heat a wok or frying pan over high heat. Drizzle in oil and swirl around, then add the ginger, garlic, chili and onion. Stir-fry 2 to 3 minutes to release the flavors. Add the pork, and stir-fry 3 to 4 minutes, adding 2 tablespoons stir-fry sauce as you go. Add the bell peppers, and continue stir-frying, gradually adding all remaining stir-fry sauce until the dish is cooked to your liking. Remove dish from heat. Chop up the mint, and fold in. Taste-test the dish for a balance of flavors, adding more fish sauce if you'd like a deeper or saltier taste. More chili can be added for more spice. Serve with Thai jasmine rice, and enjoy!